Hammerhead 2017 - More space, more games, more and better facilities, but no increase in cost for visitors and traders. For the visitors to Hammerhead, we promise to get you into the venue quickly and efficiently - we will not leave you standing outside! 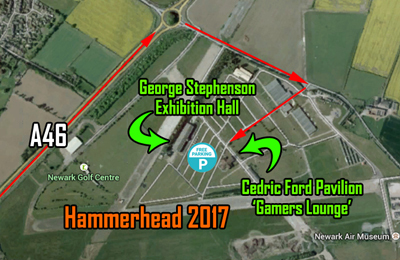 There are 3 points of entry to Hammerhead, one in the Gamers Lounge and 2 in the George Stephenson Hall. While photos of queuing visitors may look good for promotion photos, it is not a pleasant experience if you are standing in the queue! Once you have your wrist band, you have easy access to both halls. Throughout the day there will be members of The Forest Outlaws Wargames Club on hand to assist with parking, security, distribution of wrist bands etc., as well as running some of the games. 70 Public Participation Games at Hammerhead 2017! As well as every game being public participation, Hammerhead is open to all genres and scales of table-top gaming. We deliberately mix historical, fantasy and sci-fi games of different scales throughout the halls so as not to create ‘zones’ of particular types of games – a kind of mixed minestrone soup of miniature gaming! This policy makes for a more interesting experience for visitors as they move from one game to another. Running a game can be a very rewarding experience – it’s a real ice-breaker and great way of communicating and forming friendships with fellow gamers as you roll some dice! There are currently 70 public participation games booked in, plus the DBA Northern Cup competition. The addition of the Gamers Lounge has made it possible to accommodate more participation games and 16 more traders from the Hammerhead waiting list. 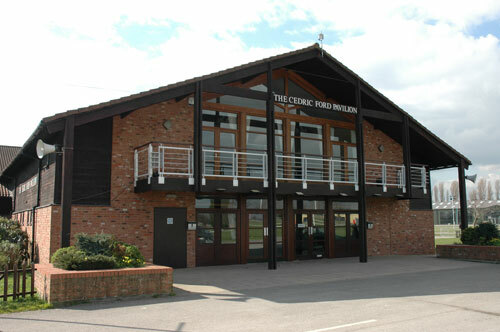 The Cedric Ford Pavilion (CFP) - Gamers Lounge, which boasts a very large comfortable, carpeted function room with its own permanent licenced bar and full catering facilities. There is a large seating area with plenty of tables so you can eat your lunch in comfort. There are also 15 participation games and 16 new traders to Hammerhead plus the DBA Northern Cup competition. The organisers will be running a DBA participation game for visitors to play. Both the venues, the George Stephenson Hall and the Gamers Lounge, have excellent wheel chair access and plenty of clearly marked disabled parking areas directly in front or to the side of the main entrances, which will be policed throughout the day. Disabled drivers can therefore shuttle between the two venues in their vehicles if desired rather than walk the short distance. Also, the additional space available in the 2017 show we will be able to maintain generous spaces between the gaming tables for greater access and mobility for wheelchair users. There are disabled toilet facilities in both the George Stephenson Hall and the Gamers Lounge. The very popular Hammerhead table top sales - ‘bring and sell’ offers gamers a great opportunity to come along sell their spare wargame kit. Unlike the traditional bring and buy the seller can negotiate the price directly with the buyers. You can hire a 6ft table for one hour at a cost of just £6. The tables can be booked on the Hammerhead website. Come and join us for a great day of table top gaming on Saturday 4th March at Hammerhead 2017.